Are You Ready For the Digital Patient? Healthcare providers and payers lag in their preparations for the digital patient. Underestimating the complex needs of the digital patient means suboptimal or even negative results from technology reforms to the healthcare ecosystem. Critical thinking and action to cope with a new form of healthcare user, customer and care colleague must begin now. Profound and pervasive changes in the financing and provision of healthcare are happening. Arrangements for creating and maintaining the digital patient are less intensive. In some cases, digital patients are seen as having modest needs that can be met with simple changes to existing systems. Yet the digital patient is more complex than a change from user of the healthcare system to consumer of this system. 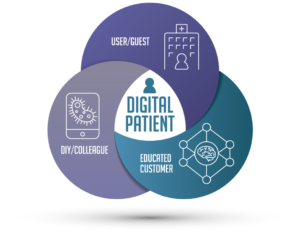 We have identified three distinct attributes of the digital patient. Each must be met differently and simultaneously to maximize impact. Each of these attributes interact with the others in different ratios and intensities depending on the capabilities of the individual. Approaches to healthcare are often situationally diverse, meaning that the healthcare system must adapt to unique needs at different times. A unilateral response to individuals cannot sustain the kind of engagement that positively affects health outcomes. Designing multivariate responses to individual needs means that technology and process changes are not interchangeable. In coming blogs, we will examine each of the attributes and how to approach solving the healthcare ecosystem’s response to a more complex and demanding audience. Please subscribe to our blog to stay tuned to this series. You may also reach out to EC-United Executive Partner Robert H. Booz for more information (rhbooz@ec-united.com).